Reliability | Ce n'est plus ce que c'était ! ça fonctionne maintenant. I am going to do a presentation about “JBoss Enterprise Workflow/BPM and Rules Solutions” in Belgium in May 2012. 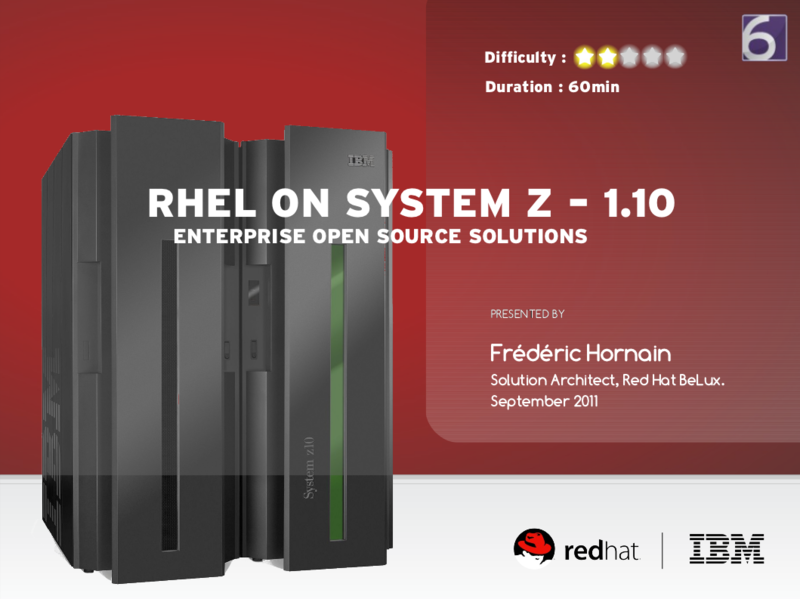 I am going to do “RHEL On System Z” presentation @ Total Solution Event for System z, Brussels, September 28-30, 2011. If you or your company are based in BeNeLux and are interested by this presentation, just let me know and I will try to arrange a Meeting for you. On August 25th we are organizing a special technical afternoon session for our customers and partners. Red Hat can help customers plan their IT infrastructure – from Open Source Software to Virtualization, Cloud Computing and much more. 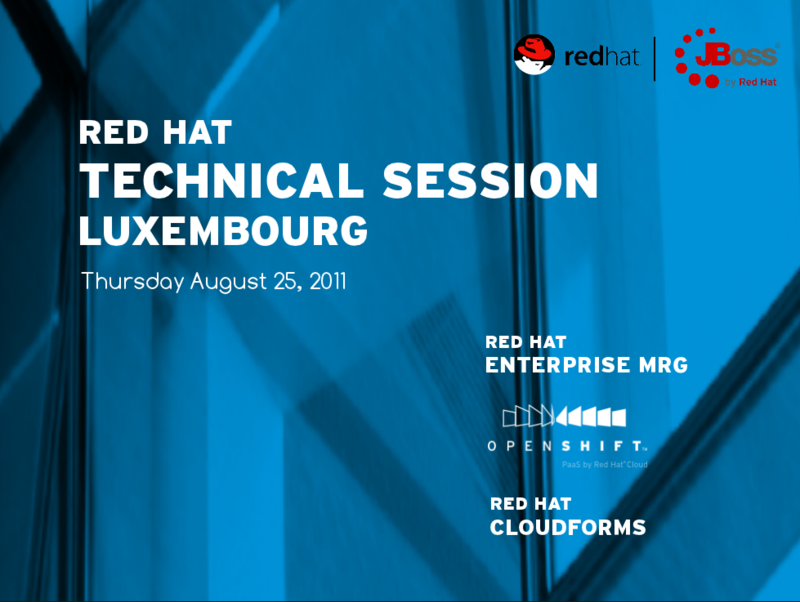 This technical session will inform you about Red Hat Enterprise MRG, CloudForms and JBoss as a Fabric (Openshift). It will also provide you with the possibility to discuss technical issues with Red Hat experts and your peers. MRG Used by many financial institutes, Red Hat Enterprise MRG is a next-generation IT infrastructure incorporating Messaging, Realtime, and Grid functionality. It offers increased performance, reliability, interoperability, and faster computing for enterprise customers. CloudForms CloudForms redefines the IaaS cloud market by incorporating both comprehensive application lifecycle management and the ability to create integrated clouds from the broadest range of computing resources with unique portability across physical, virtual, and cloud computing resources. JBoss as a Fabric (Openshift) At Red Hat, we have been working hard towards a broad and open cloud stack that covers everything from IaaS through PaaS to SaaS. Among these, PaaS will likely be of most interest to the JBoss developer. But what exactly is this “platform”? What am I, as a developer, going to code against? And what am I, with my operator hat on, going to monitor and manage? We will close this meeting with networking drinks and snacks. Registration Join us for this exclusive technical session. Spaces are limited so register today to ensure your place. Please send an e-mail with your contact details to redhat@artdcom.com. We look forward to meeting you on August 25th!